Educational workshop calendar coming soon! CAS brings a unique approach to education by offering workshops in a master class format. Whether it be in film, music, or the arts; our goal is to provide you with the most relevant cutting edge information to aid you in your chosen craft. As a working production studio, CAS offers the opportunity to learn industry techniques from working professionals with the latest technology. Do you have a class you would like to teach? 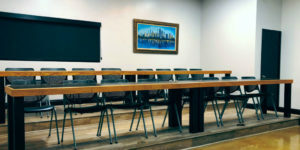 Our classroom with projector and large screen is available for rent as well. Here is a short list of a few of our up in coming classes!